DALLAS – October 13, 2016 – UT Southwestern Medical Center researchers have developed an MRI-based method that can track the state and progression of a common type of genetically mutated brain cancer. The study showed that 2HG is an excellent biomarker for tracking certain gliomas with IDH mutations and also can provide a diagnosis when neurological risk from surgery is too high, researchers said. Researchers used MR spectroscopy, a method for distinguishing the chemical makeup of normal vs. mutated brain tissue, to track 2HG concentrations. "We can measure 2HG concentration and follow it during the disease course – it's stable over long periods of time when the tumor is stable, increases when the disease progresses, and is an excellent marker of tumor response because it falls in response to treatment that is working," said senior author Dr. Elizabeth A. Maher, Associate Professor of Internal Medicine, and Neurology and Neurotherapeutics. According to the National Cancer Institute, cancers of the brain and nervous system affect nearly 24,000 people annually. In 2013, there were an estimated 152,751 people living with brain and other nervous system cancer in the United States. The overall 5-year survival rate is 33.8 percent. In addition to its value in clinical care, the application of 2HG imaging to clinical trials of IDH inhibitors is already underway at UTSW. Researchers from UT Southwestern's Peter O'Donnell Jr. Brain Institute and Harold C. Simmons Comprehensive Cancer Center collaborated with investigators in the Advanced Imaging Research Center to identify 2HG (2-hydroxyglutarate), a metabolite that is produced in gliomas that carry IDH (isocitrate dehydrogenase) gene mutations. Using MR spectroscopy, the team announced in 2012 that they could detect 2HG in the tumor with high sensitivity and specificity. This next-step study, which appears in the Journal of Clinical Oncology, showed that 2HG can be useful in tracking the disease, researchers said. "This is the first non-invasive biomarker for brain cancer and represents a major advance for the field. Our current imaging is not nearly as precise and takes a longer time to see results," said senior author Dr. Maher, who holds the Theodore H. Strauss Professorship in Neuro-Oncology. "Within a week of starting treatment, we know whether we 'hit the target'. This new method will be a much more rapid way of assessing the therapy – allowing the physician to know to stop treatments that aren't working or continue treatments that are." Most biomarkers are in the blood, so identifying biomarkers that can be tracked without drawing blood or obtaining a tissue biopsy is particularly valuable, said Dr. A. Dean Sherry, Director of the Advanced Imaging Research Center and Professor of Radiology at UT Southwestern, and Professor of Chemistry at UT Dallas, where he holds the Cecil H. and Ida Green Distinguished Chair in Systems Biology. The technique also may serve as a model to develop other imaging biomarkers for the brain, and already is being used to learn more about the biology of glioma, the most common type of brain cancer. "In terms of research, the biomarker is a 'window' into IDH-mutant glioma biology and we are using it to learn more about how the tumor grows, responds to therapy, and ultimately becomes resistant to treatment," said lead author Dr. Changho Choi, Professor of Radiology and with the Advanced Imaging Research Center, where the study was performed using a dedicated research MR scanner. 2HG tracking also could prove useful in diagnosing some brain tumors in which typical surgical procedures to obtain tissue samples can't be done. That may be because the tumor isn't accessible, such as near the brainstem, or when trying to get a sample could cause neurological damage. These patients are excluded from clinical trials because of the lack of available tumor tissue for diagnostic analyses. "We established in this study that 2HG levels in these tumors can be used to make a 'presumptive' molecular diagnosis of an IDH mutation, based solely on imaging," said Dr. Choi. The impact of this finding is that the patient's physician will have a clear direction for treatment, including recommending a patient for treatment in a clinical trial. Dr. Maher said they were also very grateful for the study's participants. "We could not have done this research without full partnership with the 136 patients who participated," she said. "They came for separate research scans multiple times during the course of their treatment. They often came on non-clinic days, needed family to bring them, and often spent up to 90 minutes in the scan. Their contribution may help change clinical practice in this field and demonstrates the importance of tracking an imaging biomarker." The study was supported by the National Institutes of Health, the Cancer Prevention and Research Institute of Texas, Young Texans Against Cancer, the Advanced Imaging Research Center, the Annette G. Strauss Center for Neuro-Oncology, the Miller Family Fund in Neuro-Oncology, and the Gladie Jo Salvino Fund for Glioblastoma Research at UT Southwestern. Additional UT Southwestern faculty who contributed to the study include: Dr. Jack M. Raisanen, Professor of Pathology; Dr. Song Zhang, Associate Professor of Clinical Sciences; Dr. Kimmo Hatanpaa, Associate Professor of Pathology; Dr. Dwight Oliver, Associate Professor of Pathology; Dr. Samuel Barnett, Associate Professor of Neurological Surgery and Otolaryngology; Dr. Christopher Madden, Associate Vice President and Clinical Director of the Peter O'Donnell Jr. Brain Institute, and Professor of Neurological Surgery; Dr. Toral Patel, Assistant Professor of Neurological Surgery, and Neurology and Neurotherapeutics; Dr. Edward Pan, Associate Professor of Neurology and Neurotherapeutics, and Neurosurgery; Dr. Bruce Mickey, Professor of Neurological Surgery, Otolaryngology, and Radiation Oncology, who holds the William Kemp Clark Chair of Neurological Surgery; Dr. Robert Bachoo, Associate Professor of Neurology and Neurotherapeutics, and Internal Medicine, who holds the Miller Family Professorship in Neuro-Oncology; and Dr. Craig Malloy, Professor of Radiology and Internal Medicine, and with the Advanced Imaging Research Center, who holds the Richard A. Lange, M.D. Chair in Cardiology. Authors' disclosures of potential conflicts of interest are found in the article online. Public disclosures of conflict of interest for UT Southwestern faculty is available here. The Harold C. Simmons Comprehensive Cancer Center is the only NCI-designated Comprehensive Cancer Center in North Texas and one of just 47 NCI-designated Comprehensive Cancer Centers in the nation. Simmons Cancer Center includes 13 major cancer care programs. In addition, the Center's education and training programs support and develop the next generation of cancer researchers and clinicians. Simmons Cancer Center is among only 30 U.S. cancer research centers to be designated by the NCI as a National Clinical Trials Network Lead Academic Participating Site. 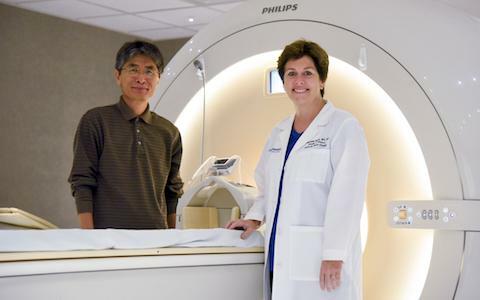 The Annette G. Strauss Center for Neuro-Oncology, the cornerstone of UT Southwestern's Neuro-Oncology Program, is comprised of multidisciplinary cancer professionals that are largely involved in innovative clinical research trials. Researchers are actively involved in projects aimed at creating new and improving existing treatments for childhood and adult brain malignancies. Its focus is to improve treatments available for patients, both inpatients and outpatients, and conduct research of tumors of the central nervous system, including benign and malignant brain and spinal-cord tumors.